Up to 2018, “pre sales” were still being offered for titles announced as long ago as 2005, but never produced. While buyers experienced an ever growing list of broken promises, Connor made a series of high profile success claims, from promoting business expansion to Publishers Weekly, to securing a $500,000 settlement in Peter Beagle’s name for The Last Unicorn film rights. (The mystery of where the money went is part of Peter’s lawsuit against Cochran). There was an international movie tour, and a planned $5 million budget for projects that never materialized. Connor even boasted that investors were lining up to provide $15 million for a musical, and $125 million for a live action movie remake. It all must have been incredible bait to secure cooperation from Peter’s family, and pressure Peter into compliance. It worked to secure $300,000 from movie tour investors (who are also suing to figure out where their money went.) 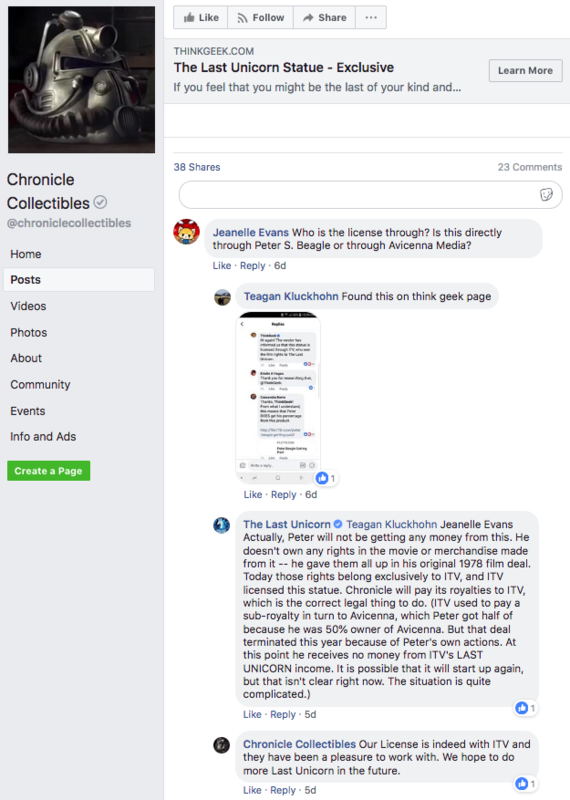 Their recent court docs say that they paid Connor based on his claims to have permission to proceed with development projects and remastering The Last Unicorn movie, but he didn’t. According to an interview where he said “I kind of cheated“, he may not have had permission to start The Last Unicorn Tour in the first place. The lost lawsuit against Peter’s lawyer for representing him. The failed attempt to seize conservatorship using Peter’s family. The lost countersuit against Peter himself. See the sidebar of this site for much more about the failure of these tactics. The truth is winning but the damage is severe. The comments appear on File770’s news about a lawsuit by Patrick Lake against Connor for defamation, for claiming that a contract between them was “forged.” (The defamation appeared in an unreliable post at Bleeding Cool in 2014). 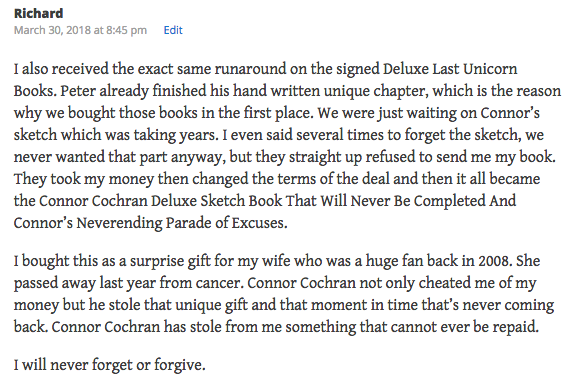 Previously, Lake was mentioned here in a request for info from fans about behavior by Connor and Conlan Press. Here’s Peter Beagle’s statement of support for Lake. A 2014 statement about Fans Against Fraud, supposedly written by Peter, was posted by an account maintained by Connor Cochran and his staff. The social media staffer from that time later posted an open letter about being misled. Connor is now using at least his fifth attorney in this legal battle. Previous representatives for his dispute with Lake included Rob Liskey, Richard Mooney, Robert Kane, and the firm Broderick and Saleen (who dropped him in 2015). James R. Thompson also appears on the list of outstanding creditors in his bankruptcy. (Apart from real lawyers, there’s also Connor’s long-time behind-the-scenes partner in deceptive business practices, disbarred lawyer Charles Petit.) After being dropped as a client by others, Connor is currently left with representation by a personal friend, who told a bankruptcy court that he’s helping without pay. After cheating so many people for so long, what does Connor have to say for himself? ← Bankruptcy court sends Connor Cochran to liquidation, with new details about his shady business for The Last Unicorn Tour.